First came the dream during my first night at Uluru while the rain kept falling and accumulating at my window. I was deep asleep and the dream then seemed so real… I was alone and cold following a large snake on the ground leaving behind him a trail of shiny skins every 10 meters or so: the strange creature was constantly growing out of it, getting larger every time. He was leading me from the sandy ground to a rain forest, so lush and green, I couldn’t believe I was in the middle of the desert. I just came back from Uluru (Ayer’s rock) and the dream was real. Not too far from my slumber, Uluru and Kata Tjuta were shadowing a breathtaking countryside. This unique monoliths of sandstone disturb violently their flat and desert surroundings close to the geographical center of the country. We are in the red heart of Australia and nothing compares. Uluru is a sandstone monolith of 348 meters high with most of its bulk below the ground (about 15 km). Kata Tjuta is made up of a group of 36 conglomerate rock domes that date back 500 million years. The later eroded more than Uluru and was pushed out of the ground much less but it stature is magnificent and many considers it more spectacular than Ayer’s rock. The national park was handed back to the Anangu people in 1985 the ownership of the land and are now joining their effort to preserve this site. Both rock formations are sacred sites. 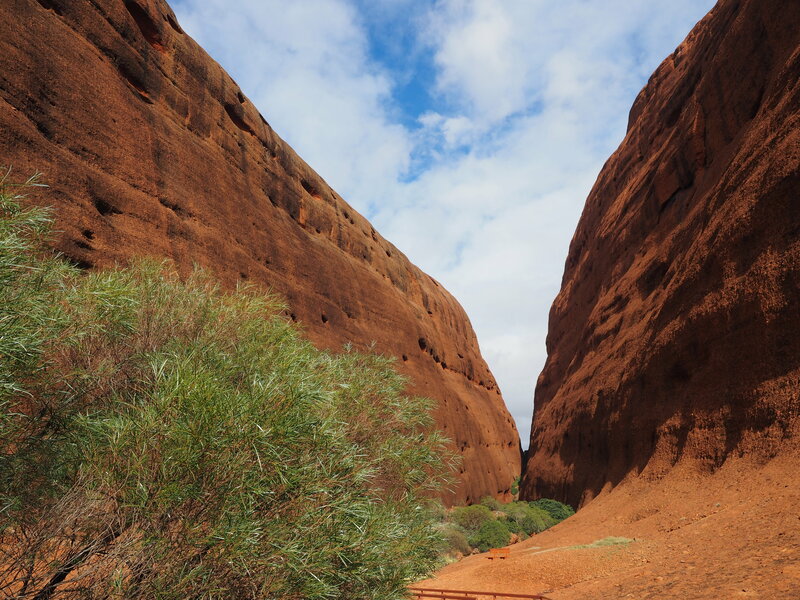 Uluru isn’t formally forbidden to climb but the Anangu have asked the tourists to respect the place and on their own freewill to not climb it. Kata Tjuta (the Olgas), meaning ‘many heads’, is a sacred place relating to knowledge that is considered very powerful and dangerous, only suitable for initiated men. It is made up of a group of 36 conglomerate rock domes that date back 500 million years. Welcome to Aboriginal land. We have very significant law here on our land and we look after it properly. There is women’s law and the men’s law here on our land. And we look after our place properly, looking after it together. Properly holding on to our law for our children and those that come after us. When we grow old and finish up the children that will follow will continue to have it. Anangu law… Tjukurpa… is the foundation of all Anangu life and society. It’s the basis of relationships between people, plants, animals and the land. 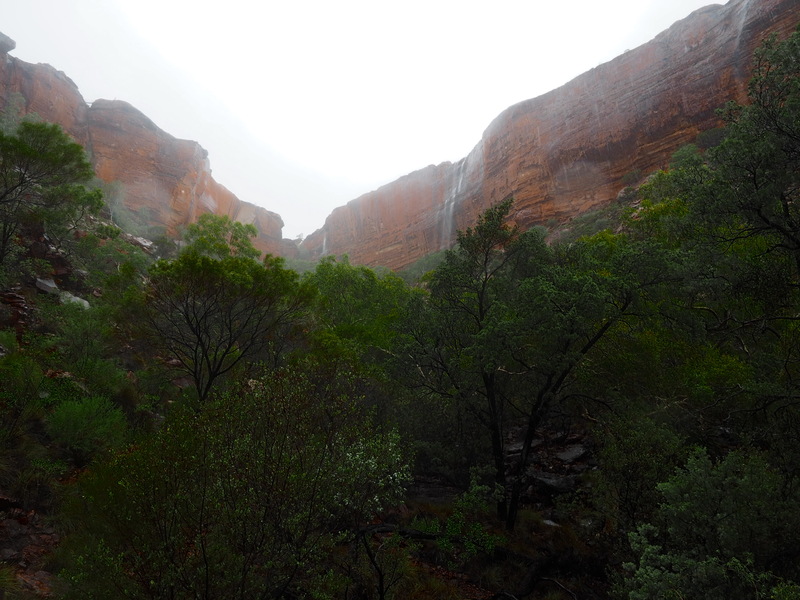 My stay was unusual: In few days, more rain fell in the Australian desert than they ever saw in a year. Like the snake in my dream I was in a rain forest and walked in water almost to my waist in King’s canyon and crossing creeks that were usually dried up little dips. The cross country highway was also closed because of the flood. The only difference is that I was the snake, shading my shrinking ideas away one by one behind me and feeling warmer from doing so. This was a very special voyage. I will never forget it. lots of love to both of you. 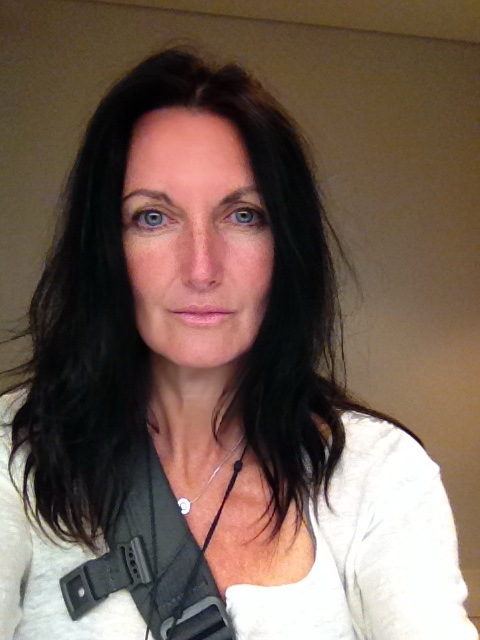 A fabulous photo journey … and it fits well with the dream. Thank you. We all keep shading our skin, some more than other. Story are made by you as well as me. Your imagination will give you the rest. It is far from being over. Thank you for your support and appreciation. A. Many thanx for sharing the photos and info on this site. Gotta love Nature! Wow, what an awesome job you have done of capturing the fiery colours in the stone. I hope one day I see this for real but until then thank you so much for taking me there with your travelogue. This country doesn’t stop to amaze me. The center is a must see and I think must live as well to experience it fully. It is on my agenda.